A blast from the past is Caroline Munro. Perhaps her best known performance was in THE GOLDEN VOYAGES OF SINBAD. After looking at this picture, if you haven't seen the movie, you'll want to...badly!!! To classify as a SPACE GIRL, Caroline also starred in the space opera spoof STARCRASH. Have you ever heard of it? I haven't... But what the heck, enjoy Caroline in her harem costume. 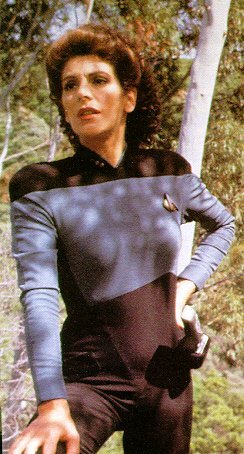 I've had a few requests for at least one more shot of Marina Sirtis. While I have screen caps from DEATH WISH 3, I think this shot from STAR TREK is more appropriate for the SPACE GIRLS page. If you want the other shots of Marina, just surf the 'net. You'll find them. So, here is another shot of Marina. Also back by popular demand is another shot of the "new" SLIDER queen, Kari Salin Wuhrer. Even clothed, Kari is HOT.